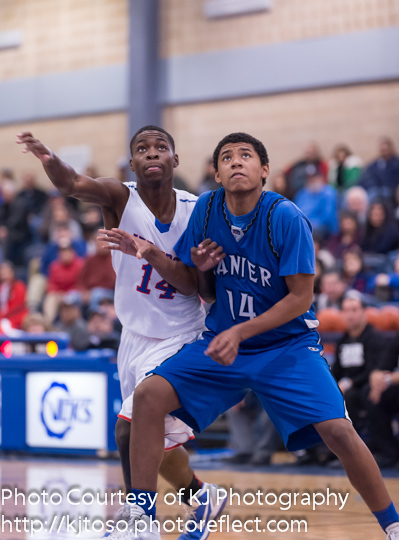 Lanier's Isaiah Vargas boxes out Jefferson's D'Andre Melton. AREA TEAMS INCLUDED: Brackenridge, Lanier. Lanier (10-11, 3-0) remained undefeated in District 28-5A Dec. 19 after surviving a threat from Brackenridge (7-8, 1-2) at the Alamo Convocation Center. The Voks rallied to win 73-70 in overtime. Two juniors stepped up to help the Voks stave off the Eagles as overtime wound down. Raul Solis (21 points), a post forced to play point guard because of Lanier’s foul trouble, drove for a three-point play with 28 seconds remaining. Guard Joe Soto (8 points) made two free throws with 8.5 seconds to clinch the win. Brackenridge led 37-36 at halftime and 50-46 after three quarters. Junior center Richard Wallace led the Eagles with 26 points. Isiah Saenz chipped in 18 points. Jalen Davis scored nine. Solis was Lanier’s top scorer. James Castellano scored 12 points, C.J. Salazar had 11 and Isaiah Vargas finished with nine.